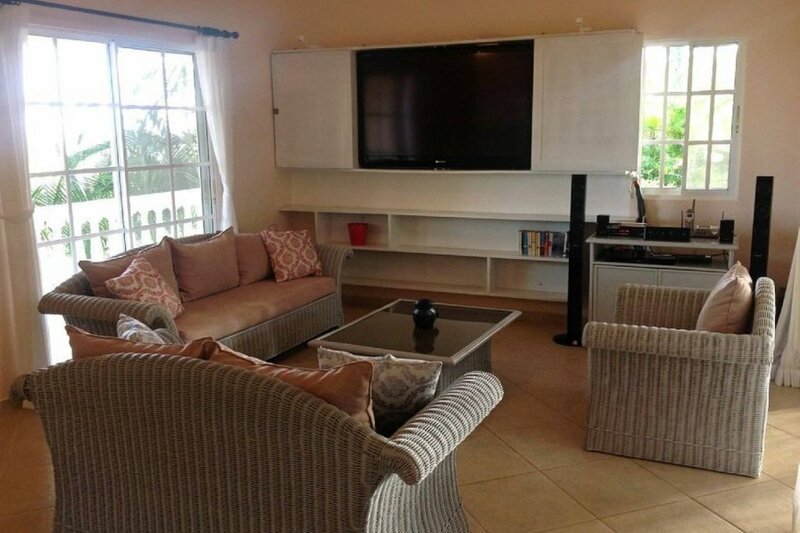 This 4 bedroom villa is located in Sosua and sleeps 8 people. It has WiFi, parking nearby and air conditioning. "Modern 4 bedroom Luxury Villa!!! Gated community with 24 hr security, tennis and basketball courts, Walking distance to fine beaches, restaurants, clubs and casino. No Car Necessary, Ocean and Mountain Views, Beautiful Private Pool, Tropical landscaping designed for maximum privacy, Custom Furniture designed for comfort and luxury, Washer and Dryer, Grill, Free Phone Service, 3 Baths, Free Daily Maid Service, Optional chef service, Cable, Wireless Internet, 3 large TVs (60, 50, 42 inch flat screens), 2 23 inch flat screens, Blu Ray and/or Sony Stereo system in every room. Villa is walking distance to town, the supermarket, restaurants, clubs and the beach. Area known for world class water sport activities (15 min. ), zip lines/monkey jungle (30 min), top golf resort (1 hr).Car and motor bike rentals are available in town at reasonable costs. Villa has a 4 movie boxes with over 100 Blue-Ray and DVD titles (classics, kids, drama, religous, action, horror). Ipod/Alarm Clock players in each room. Laundry is 5 per load for washing, drying and folding and must be done by our maid. Check in time is 3:00pm. Check out time is 11:00am."